K atherine's childhood had its share of challenges. As a toddler, she suffered an accident which caused brain damage that impacted her life significantly. She has been a faithful attendee every Thursday night at the Loving Help program for over a year. She comments often how coming to class is the highlight of her week, and she appreciates all the kind people she has met. While she loves learning new things, being a part of the Loving Help community is what she enjoys the most. She also especially appreciates graduation night each session as she had never graduated before Loving Help. Now in her 60's and holding her graduation certificate with a smile, it is clear that Katherine's life is touched by Loving Help community, and she know her value in God's eyes! F or Emily, the Loving Help budget program was a fresh start and a renewed hope that life could be better. Upon meeting her budget mentor, Emily knew she had found a friend and someone who would always be in her corner. They journeyed through a year together, celebrating successes and learning from mistakes, all while rekindling hope in Emily's life. Emily set financial goals that at one time seemed unreachable. Through applying what she learned in class and working with her budget mentor, Emily concurred all of the financial goals she set for herself. She was especially proud to be able to afford an out-of-state family reunion on a fixed income. Now that Emily's year long mentorship is done, she still faithfully attends the Loving Help Bible study class. In her words, "I love it so much, I just can't stay away". John was connected with a mentor team through Love INC of O'Brien County’s mentor ministry specifically designed for men transitioning back into the community after a time of incarceration. John's mentor team was faithful in their time with him, meeting weekly and walking alongside him while he stayed committed to sobriety, was promoted into management at his place of employment, and got involved in the community as a passionate volunteer. As John’s time in the mentor ministry came to an end, his mentor team was impressed with his commitment to his faith in God, his maturity, and his dedication to seeking God’s will for his life. Not only this, but they recommended John be trained as a mentor through Love INC’s mentor ministry. John is now ready to begin mentoring a man coming out of incarceration and has first-hand experience of what this man is going through. God has done an amazing transformation in John’s life and is now using him to reach others who are walking the same road he once did. 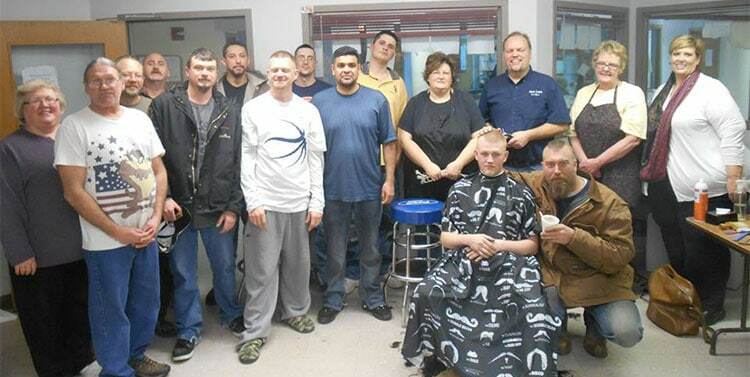 S everal Christian barbers and beauticians served men living at the Residential Treatment Facility with free haircuts. One volunteer shared a powerful testimony with us: "Transforming lives and radiating joy--I saw it one haircut at a time. Nothing makes you feel good, stand a little taller, and make your smile a bit brighter than a fresh haircut, and these beauticians and barber did that and more with these men. There were a couple of guys that if you would have taken a before and after picture, you would not have said it was the same person--hmmm, not sure if it was the haircut or the smile that you didn't recognize them. That place was rocking with fun and laughter whether you were getting a haircut or getting advice from the 'peanut gallery'. Nobody could watch themselves get a haircut. They needed to trust and believe in the person giving them the haircut. I am telling you it was amazing."